Principal Ed Keller, English teacher Mike Pape, BOE President Ben Giovine, Superintendent David Healy, Assistant Superintendent Dr. Marc Natanagara, Steelcase Regional Director Dennis Guidera and English teacher Kit Coe gathered in front of the Active Learning Center to perform the ribbon cutting. 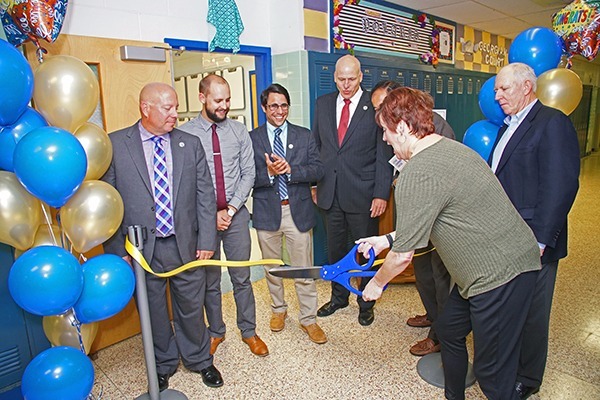 In an event culminating months of efforts, Toms River Regional Schools hosted a grand opening ceremony and ribbon cutting to mark the official opening of a new Active Learning Center located at the district’s largest high school, Toms River High School North. The overhaul of an English classroom at the high school was made a reality after the district won Steelcase Education’s prestigious Active Learning Center Grant, valued at $65,000. High School North was 1 of 15 schools and universities chosen from nearly a thousand applications as a grant recipient this year. 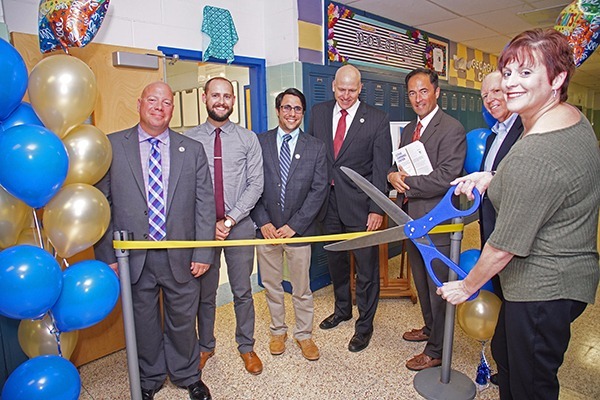 During the summer, dancker, a NJ-based interior solutions provider, partnered with the building staff and the district’s facilities team to transform the classroom into an interactive model classroom. 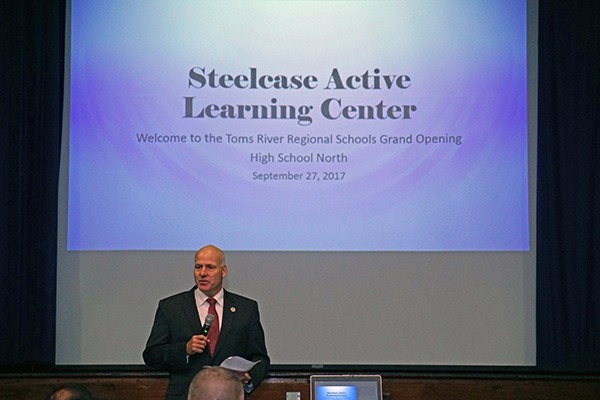 At the grand opening, the district welcomed representatives from Steelcase, dancker, Board of Education members, district administrators, community members, parents and students. After a welcome and presentation in the school’s auditorium, attendees of the event had the opportunity to view the classroom and experience firsthand the flexible seating, warm and welcoming furniture, integrated technology, and get a glimpse of exactly how these enhancements can boost student learning. Before dozens of community members in the high school auditorium, Superintendent David Healy acknowledged that a project like the Active Learning Center was the result of a true team effort. He went on to thank everyone who was involved in the process and commended teachers Kit Coe and Mike Pape for their vision for their students. Mrs. Coe and Mr. Pape have been teaching their sophomore and junior English classes in the new classroom since the beginning of the 2017-18 school year. The teachers were on hand at the grand opening to answer questions and demonstrate how they use the classroom furniture and technology integrations to enhance their lessons for students. To this point, the Active Learning Center aligns perfectly with the district’s initiative to infuse a “learner activated” style of teaching, with more student choice, independence, and hands on learning into its secondary classrooms. Norma DeNoia, the district’s Director of Secondary Curriculum, has spearheaded this initiative and is looking forward to using this classroom as a forum to further train teachers and use it as a model to design other classrooms and spaces throughout the district. The grant from Steelcase is in its third year and has only been awarded to 45 schools, colleges, and universities during that time. This year, High School North was the only school chosen in the tri-state area and is among other winners such as the University of Notre Dame and the University of Massachusetts. Superintendent David Healy thanked everyone who was involved in making the Active Learning Center a reality for the school district. 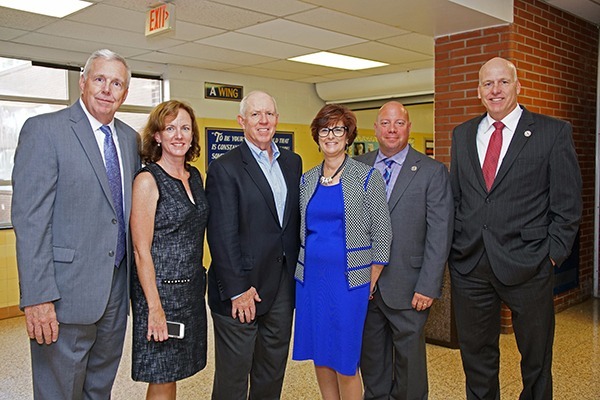 HSN Principal Ed Keller and Superintendent David Healy welcomed (l-r) Don Kolterjahn and Adrienne Welch from dancker, Dennis Guidera from Steelcase, and Mary Lynn Kearns from dancker to the campus of High School North for the grand opening ceremony. Mrs. Coe cut the ribbon in front of the classroom and all guests at the ceremony were invited inside. A plaque that designates the classroom as an Active Learning Center was unveiled. 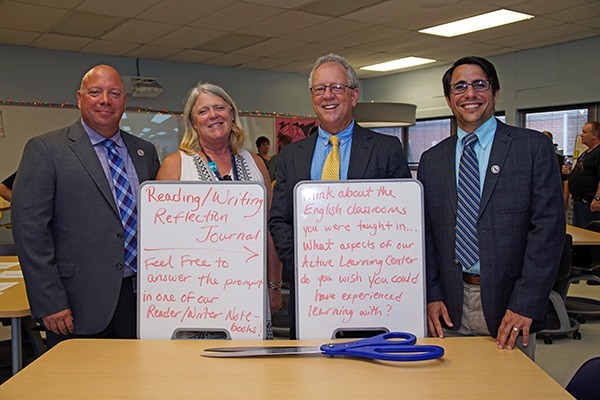 Inside the ALC, Principal Keller, BOE member Janet Bell, Assistant Superintendent John Coleman, and BOE President Ben Giovine tried out some of the features. 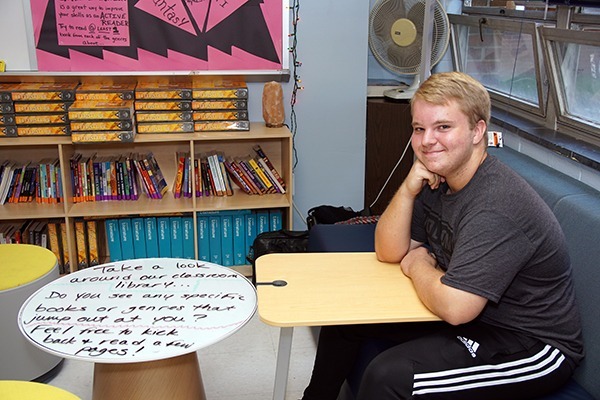 Bobby Bragen, a 10th grade English student in Mr. Pape's class, showed visitors how the Campfire Lounge area of the classroom can be used for collaborating with his peers.